There are just a few more days to go in our Bonanza! On Wednesday we will reveal our 500th bird, but today we introduce #26 in the Bonanza and #495 overall - the European Bee-eater. The European Bee-eater is an extremely colorful species of bird that breeds across much of Europe. These striking feathered jewels are migratory and most spend the winter across the southern half of Africa. There are 26 species of bee-eater in the world. This family is appropriately named - they are known to eat a lot of bees! Bees have stingers and venom, so how do bee-eaters safely consume them? 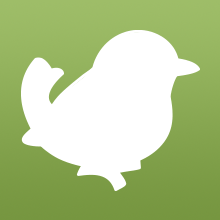 After a bee (or wasp or other stinging insect) is captured, the bird beats the insect on a hard surface. This act both removes the stinger and extracts most of the venom. Once this is complete, the insect is consumed. 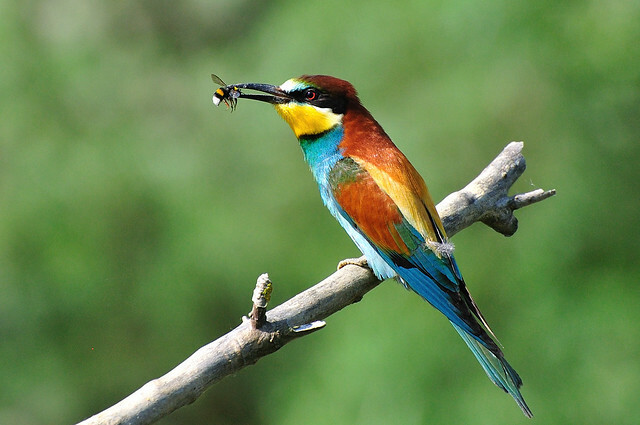 European Bee-eaters eat other insect too, but only flying ones. Prey is always captured on the wing -- perched insects are simply ignored! Tomorrow's new species is a bird of prey from Africa that, like today's bee-eater, is named in part for what it likes to eat. 5 comments on "2013 Bonanza Bird #26: European Bee-eater"
african fish eagle?becasuse of Its shape?the birds eat mainly fish but will also eat the occasional baby flamingo.thay are so powerful.with a wingspn of 8 feet. Fish eagle or snail kite.